Where is Dumb and Dumber filmed? 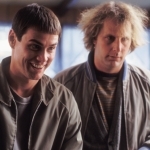 Slapstick comedy starring Jim Carrey and Jeff Daniels about a pair of idiotic friends who set off on a madcap journey to return a briefcase to its owner. However, they are blissfully unaware that the case contains a large amount of ransom money for the owner's kidnapped husband. Their trip is soon fraught with disaster, especially when the kidnappers begin to pursue them across the country with the aim of grabbing the cash.